They are between 16 – 24 years old, self-identify as Indigenous, (First Nation, Metis, Inuit) with or without government identified status and returning to school in the fall of 2017! They are meeting in Halifax on July 29th - and on August 1st they will depart on an experience of a lifetime. They are adventurous and a positive risk taker! They are excited and ready for some hard work - but amazing experiences! Youth and adults in their communities recommended them and told us why they see them as leaders! They try their best to live in balance and practices activities and strategies that help them take care of their physical, spiritual, mental and emotional well-being! They are ready to build a strong community of other young Indigenous people who, like them, are wanting to build their skills and develop healthy relationships rooted in a shared powerful experience! They are filled with have pride and knowledge about their culture and community that they want to share with others? 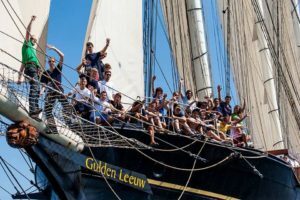 They are 45 of the young people from across Canada who applied to be a member of the crew of the Gulden Leeuw, one of the most impressive Tall Ships in the world. 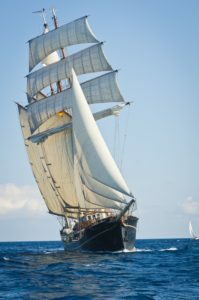 It will be their home as they sail her across the Atlantic Ocean, from Halifax, Nova Scotia to La Havre (France) in August 2017 as part of the Rendez-Vous 2017 Tall Ships Regatta, all while taking part in Msit No’Kmaq, a Sail Training and Youth Leadership Program. Msit No’Kmaq, the Mi’kmaw phrase that translates to All My Relations, speaks to the interconnectedness between all people and things. This concept of connection is an essential teaching in many First Nations, Inuit and Metis world views and guides how many Indigenous people walk the good way. The concept speaks to how everything in the universe is connected and reinforces that everyone and everything has purpose, matters, is important and belongs. The ideas, values and belief in Msit’ No’Kmag can guide participants as they relate to others, yourselves and the world you live within. This deep connection can serve the as the foundation of the relationship young people have with their family and community to the world. We’ve also been waiting…for them. Click here to meet the Warriors of the Red Road at Sea who were announced on June 21st, National Aboriginal Day! We invite your company, organization or Nation to support these Indigenous Warriors and learn more about the #FlyYourFlag Campaign!